Arkadian league. Silver triobol. ca. 175 to 168 BC. Minted at Megalopolis. Denomination : Silver triobol. Mint : Megalopolis. Date : The dating of this series is very much a controversy. Some references place these as early as 300 BC, and others as late as 50 BC. We have chosen to accept the date of between 175 to 168 BC, but this is by no means certain. Size : 15.8 x 16.2 mm. Weight : 2.41 grams. Reference : Sear-2689. SNG COP 255-9. Obverse : Laureate head of Zeus left. 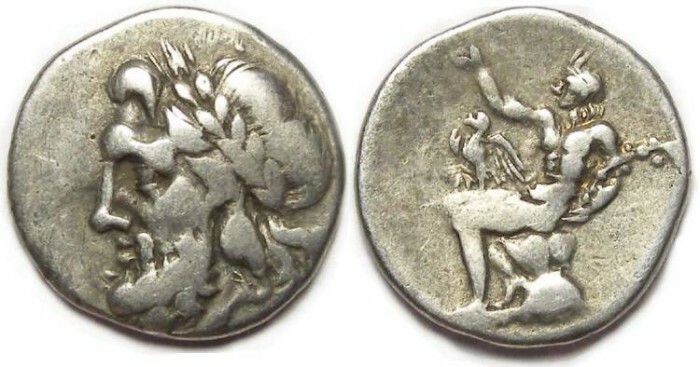 Reverse : Pan seated on a rock, holding a lagobolon, with an eagle with wings spread, on his knee. There are no inscriptions or monograms on either side of this coin.